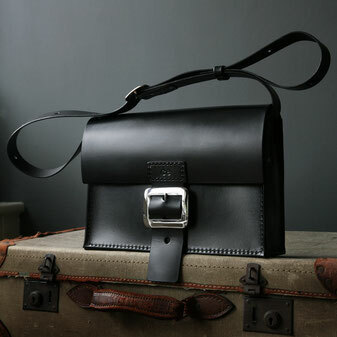 small everyday to very large luggage style satchels, all made from best british leather, sourced from a small family run tannery in the west midlands. 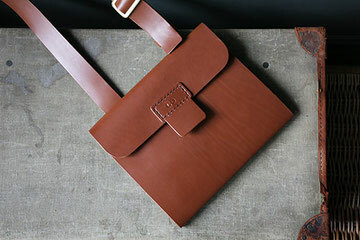 the satchels are both practical and stylish and are a contemporary take on a traditional classic. finished with limited edition brass or chrome plated feature buckles, all have an adjustable shoulder strap and can benefit from additions such as ticket and phone pockets, dividers, handles, key fobs and initials to make the piece unique. a truly original collection of sleek, hand stitched box bags, featuring clean lines, punched handles and simple pockets. laptops and tablets fit snugly inside, leaving room for phone, keys purse. 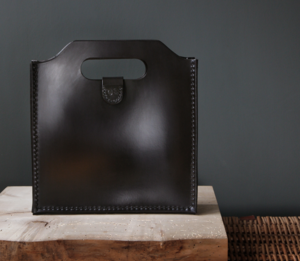 made from superb quality saddlery leather and finished with solid brass and chrome fittings. a range of leathergoods for keeping papers, laptops and tablets safe and secure, whilst maintaining sleek lines and simplicity of design. pieces can be made to specific sizes, straps and pockets can be added and initialled to personalise. to compliment the larger pieces of the collection with an emphasis on pared down style and simplicity, purses for keeping coins safe and slip neatly into a pocket. key fobs and wristlets to match the bags and satchels, wallets with magnetic fastenings or simply billfolds with matching card holders. 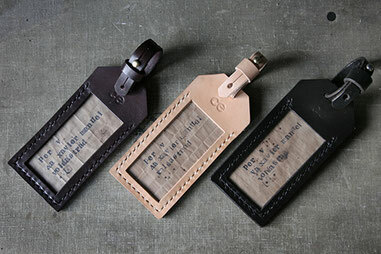 luggage labels for the seasoned traveller all hand stitched from single source British leather.